BlackBerry announced on Thursday it plans to offer a solution that will separate and secure both work and personal data on the most dominant mobile platforms: Apple's iOS and Google's Android. BlackBerry's Secure Work Space will be available on platforms other than the company's own, as the smartphone maker looks to regain lost ground in the highly competitive mobile market. 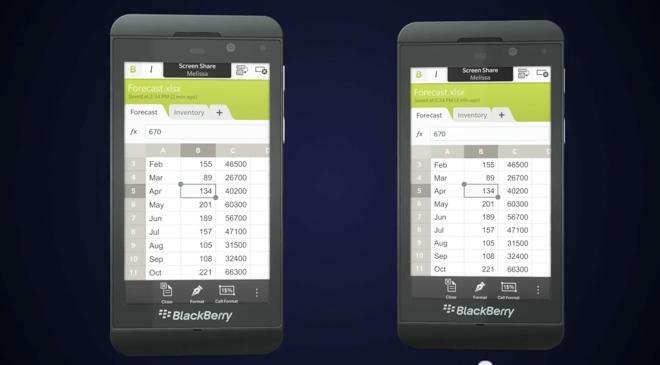 The Secure Work Space will be managed through BlackBerry Enterprise Service 10, and is expected to launch in June. The solution for third-party platforms will include secured client applications for e-mail, calendar, contacts, tasks, memos, secure browsing, and document editing. The service aims to give iPhone and iPad users the ability to access data and applications behind corporate firewalls without the need to manage and configure a VPN connection. BlackBerry touted Secure Work Space as "a secure and reliable solution" that it hopes will be the "clear choice for enterprises and governments" in allowing employees to bring their own iOS and Android devices into the corporate space. "With BlackBerry Balance technology, we offer the industry's only true compromise-free separation of work and personal data and applications, said David J. Smith, executive vice president of Enterprise Mobile Computing. With Secure Work Space for iOS and Android devices, we're extending as many of these features as possible to other platforms, critical in todays Bring Your Own Device (BYOD) world. BlackBerry Enterprise Service 10 offers administrators a single, intuitive platform enabling them to effectively and securely manage a variety of devices while protecting their corporate assets and at the same time providing employees the flexibility they desire." Closed beta testing for Secure Work SPace has already begun, and general availability is expected to be offered by the second quarter of this year. More details have been promised at the BlackBerry Live conference in May, to be held in Orlando, Fla.
"The vast majority of smartphones on the market arent adequately secure for corporate or government work," said Robert Enderle, principal analyst with Enderle Group. "Currently BlackBerry Enterprise Service 10 combined with BlackBerry Balance or Secure Work Space has the only volume solution which has been designed from the ground up to provide the security most IT departments require. With this announcement BlackBerry is expanding beyond their own top to bottom approach to security to address this need on other platforms." Last year, BlackBerry, then known as Research in Motion, launched its "Mobile Fusion" mobile device management software for enterprise customers. That added the ability to manage iOS devices, in addition to BlackBerry and Android handsets. Once a dominant player in the industry, BlackBerry has fallen on tough times in both the government and enterprise markets. The company has pinned its hopes on the newly launched BlackBerry 10 platform, and touted this week that an unnamed company in the U.S. has already placed orders for one million BlackBerry 10 devices. "An order for one million devices is a tremendous vote of confidence in BlackBerry 10," said Rick Costanzo, executive vice president of Global Sales at BlackBerry. "Consumers are ready for a new user experience, and BlackBerry 10 delivers. With strong partner support, coupled with this truly re-invented new platform, we have a powerful recipe for success."